Comment: We have an open concept kitchen/Living Room combination. The walls and trim need to be painted. As well as the ceiling. There are accent walls in the kitchen that have a faux finish right now. I would like to update the color. Bought paint for a DIY but am unable due to back issues. I see that you use a particular paint brand. Would you be willing to use the paint that I have purchased? Comment: Just bought 15 year old home. Sellers recently painted every room a very pale blue. I would like a bunch of the rooms painted- all downstairs and a couple bedrooms. and maybe bathrooms. Most rooms are empty. Started moving a few things in( mostly to basement & garage) & sleep on a mattress there a couple nights a week in a room that doesn't need painting. Comment: Kitchen and laundry walls and ceilings need painted. some trim needs installed, caulked and painted. Comment: 2-story contemporary house with attached garage needing re-staining. George J Grove & Son Inc.
Coopersburg Painting Contractors are rated 4.83 out of 5 based on 358 reviews of 42 pros. 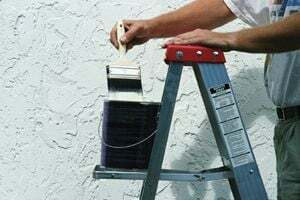 Not Looking for Painting Contractors in Coopersburg, PA?